Whether your Harrogate home or office is in need of painting and decorating by brushing, rolling, or modern spray equipment, all of our work is performed by professional painters and decorators. 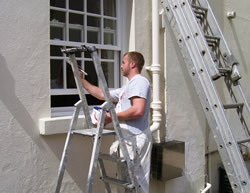 Attention to detail assures you of a quality, long-lasting decorating job. Our on-site foreman constantly monitor all phases of your project and at the close of each day we pride ourselves on clean-up with special emphasis on leaving your home or commercial property looking like new. I & C Watts' painters and decorators will start by preparing the surface of your Harrogate home or office to ensure the best paint adhesion. Pressure washing will remove dirt, oxidation, mould and mildew, loose paint and other contaminants from exterior surfaces. Any remaining loose paint will be scraped and minor or major repairs will be done before applying new coats of paint.